As a journalist, I became a finishing expert. I wrote and published about 80,000 words a year. At first, finishing a story was a huge challenge. It took me a whole day to write 700 words and more time to do the interviewing and research. I just couldn’t say goodbye to a story until I thought it was perfect. And you know what? It was never perfect. Every story needed some editing. Sometimes my editor asked me to get more information, or check a fact, or clarify my meaning. Sometimes I’d been so busy getting the words right that I added up some numbers in the story incorrectly. Huh! Slowly, I learned the art of finishing and the incredible power that it had to change my life. 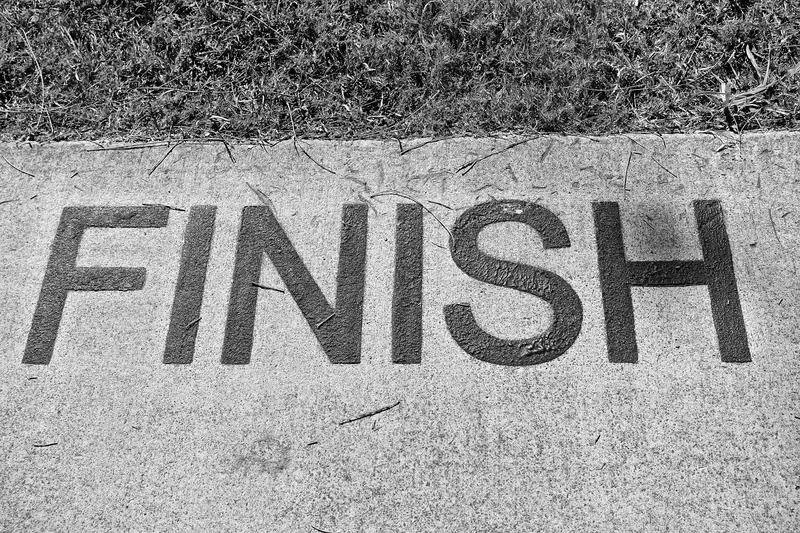 Finishing will change your life, too, if you let it. The first power of finishing was making more money. I was freelancing at that stage, and paid by the word, not the hour. Because of my perfectionism, my hourly rate was pitiful. When I learned to get the story finished, my hourly rate climbed and then skyrocketed. Eventually, I could write fast enough and hit my deadlines reliably enough to get a job on staff at Fairfax Media. More money! The second power of finishing was authority. I became known as a journalist and a good one. Readers followed my stories and found them valuable. University lecturers used them in teaching their courses, and some of the companies I interviewed bought extra copies of my stories because they enjoyed what I had written (though some did not). The third power of finishing was self-belief. Because I am a self-taught journalist and did not do a communication degree or a formal cadetship, I felt like an imposter for years. I wasn’t a ‘real journalist’. Eventually, though, I couldn’t argue with the evidence. I finished stories every week that were good enough to published in a prestigious business magazine and read by an educated and discerning business audience. This would not be possible if I was not a real journalist. Ergo, I was. One of the toughest parts of my job as a book mentor is helping my clients to finish their books and publish them. I understand how hard it is. It’s impossible not to feel vulnerable about the words we publish. What if our research is challenged? Worse, what if we make a mistake? We are taught from our earliest days at school that making a mistake is unacceptable, shameful and embarrassing. That kind of lesson sticks. 1. Going over and over stuff doesn’t make it better. I quickly learned that 80% of my story quality came in the first draft. The second draft usually brought it up to 90%. The third, fourth and fifth draft added 1% or, sometimes, subtracted 20%. I do two drafts. 2. Writing in 99% momentum. After a holiday, writing a story (or even a paragraph) was like wading through treacle. Before a holiday, with the pressure of getting things done by the time I wanted to leave, I could churn out a 3000-word story in a morning. I felt like I was flying, invincible. Was I a better writer before I went on holiday? No. I realised that writing is 99% momentum. If you want to finish, keep up the momentum. 3. Finishing is a process of letting go. Set a deadline. Finish your second draft and then let it go into the editing process. The first edit is ‘structural’. That means your editor reads your draft and checks whether everything you have written is clear, accurate and entertaining (plenty of stories and drama). If you want to be an author, learn to finish. It’s a natural human emotion to resist the process of publishing because it makes us feel so vulnerable. Find any way you can to overcome this fear. Recognise that your second draft is your best, keep the momentum going at all costs, and use the editing process as a way of letting go. It is in the process of finishing that you will earn more money, win authority and find self-belief. PS: Want more? You might like: Is your content sparking conversations?